Are you Stopping Yourself From Healing – But Don’t Realize It? We went live on Facebook to tackle an important question: Are you Stopping Yourself From Healing – But Don’t Realize It? We went live on Facebook to identify some key things you can do when you’re not getting the results or answers you’re looking for. Too often, when we first begin working with a client, we learn that they are taking many supplements – either given to them by another practitioner, suggested by a friend, or because they read about it online. Many of these supplements are a giant waste of money and can even be detrimental to their healing. Before taking any supplement, first read the “other ingredients” section to make sure there are no fillers, unnecessary added ingredients, harmful items, or useless ingredients. So often, we find that people are taking supplements that contain added ingredients that are working against them and making things worse. Dyes, fillers, coatings, flavors and a variety of other items are added to supplements. There are so many unnecessary ingredients added to supplements – most of which are to make them for esthetically pleasing. Who cares what the pill looks like, right? Often we find people taking supplements that overlap or are redundant. For example, we had one client who was taking three different detox supplements when he first met with us. Not only did these different supplements contain many of the same ingredients, they created a “detox overload” situation that was far too difficult for the client’s body, which was part of the reason he was struggling to heal. Many people take supplements with no plan in mind on why they’re taking them, when they can stop taking them, and what the overarching goals are to taking them. Sometimes people have collected these supplements on their own over time, gotten recommendations from friends, or they’ve worked with other practitioners who have recommended supplements – or some combination of all of the above. When taking supplements, you should still have an understanding of why you’re taking them, what they do to help support the body, and what the plan is to eventually eliminating them. You’ve probably heard the term: “You get what you pay for.” In the case of supplements, more expensive doesn’t necessarily guarantee good quality, but cheap supplements, well that almost always guarantees subpar ingredients, unhelpful (or even harmful) fillers, and even unsafe production. It is crucial that you use only good quality supplements, from trusted brands, that use tested production practices. For example, have you ever had that unpleasant “fish burp” when taking fish oil? That’s often an indication that the product isn’t good quality. The omega 3s in the fish oil are incredibly delicate and how the fish oil is extracted is just as important as what type of fish is used. If the process uses heat, it can render the oil rancid, which is harmful. Rather than use a safer extraction process, many companies have created a “burpless” pill by simply adding a heavy coating (also often not good quality ingredients) to the product hoping to stop the burping and keep costs down. Many times we will ask people why they are taking the supplements they bring us when we first being working with them. Often they don’t know and just took them because a friend suggested it, or they “heard somewhere” that the supplement is “supposed to help with” whatever ailment they have. Sometimes, they’ve been given the supplement by a practitioner, but don’t know why. If you are taking a supplement and don’t know for sure what it’s supposed to do and how it’s impacting you, then it may not be helping at all. This is a big one: if you have a problem with absorption (which is nearly a guarantee for people with symptoms related to autoimmune disease), then you will struggle to absorb nutrients from foods as well as herbs and supplements. The focus should be on healing the gut issues causing the absorption problems rather than simply attacking the symptoms with supplements. It is in your best interest to get the nutrients you need from foods. If necessary to help support the body beyond food, you can supplement your needs with vitamins, herbs, or other supplemental ingredients. In some cases, when you’re trying to activate a “healing response” you may need “medicinal amounts” of a specific vitamin, mineral, or nutrient that would be nearly impossible to get from food only. But surprisingly, you can get medicinal (healing) amounts from foods. For example, one of the five crucial vitamins/minerals for a healthy thyroid is selenium. Rather than taking a selenium supplement, two Brazil nuts taken daily will deliver enough selenium to help support proper thyroid function. If you heard that your aunt’s friend’s sister’s neighbor used a supplement and had a good response from it, doesn’t necessarily mean that supplement will help you. Or if you’ve read that biotin helps with hair loss and brittle nails, but you don’t know that you have a biotin deficiency and that it’s really the underlying cause of your hair and nail issues, then taking that supplement could be a waste and even harmful. Make sure have a plan and you get to the underlying reasons behind your symptoms. Guessing can be at the least a waste of money and at worst it can make you sicker. Get your advice from people who understand all the levels of what you’re going through and are educated on nutrition and supplementation. Keep in mind, it’s best to get your nutrients through food and move to supplementation only when food isn’t enough to support your body to heal or maintain health. Your body WANTS it’s nutrition through food, but sometimes, it’s not enough, so supplements may be necessary. Be careful of “health coaches” working for multi-level marketing companies that sell “health supplements” and products and only recommend supplements from their product line. There’s a huge conflict of interest in their recommendations and few are have knowledge, educational background, or experience outside of the training they received on the products they’re selling. We recently went live on Facebook to talk about how supplements might be hurting your efforts to heal – click here to watch the replay! If you want to chat with us to see if our approach to the reversal and prevention of autoimmune disease is right for you, pop yourself onto our calendar to chat with one of our health coaches. CLICK HERE pop yourself onto our calendar and we’ll chat. We recently went live on Facebook to interview a special guest about a topic many people with autoimmune illness also struggle with: binge eating. 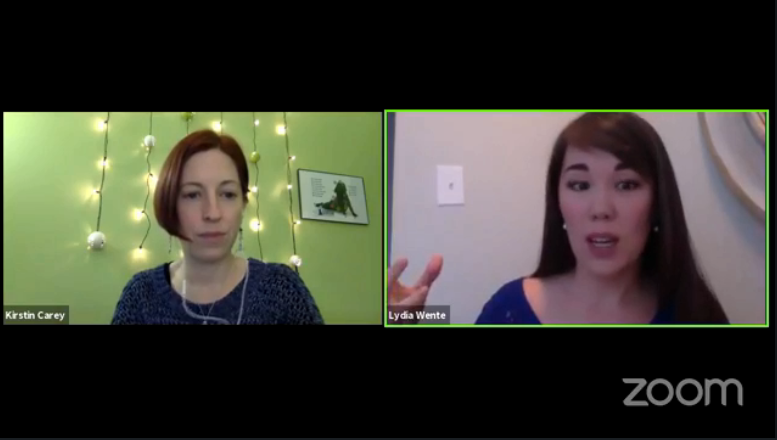 Lydia Knight is a Certified Health & Lifestyle Coach who specializes in binge- and over-eating, and will shared some great information and tools she’s learned are effective in her years of study and practice.